La Sirena Ubriaca means the drunk mermaid - it is a wine bar in the old town centre of Marsala which wine aficionados and lovers of typical Sicilian food should not miss. The drunk mermaid is originally furnished, small and large barrels make tables and chairs. 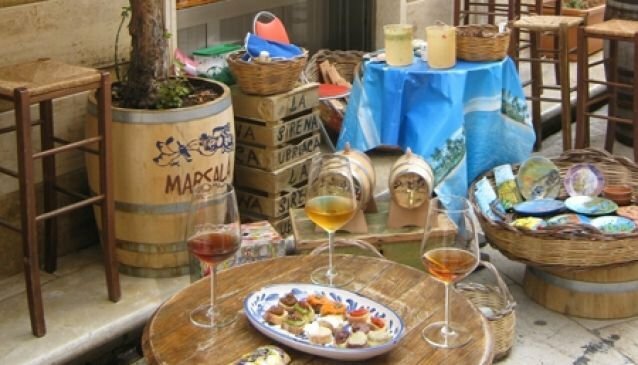 A Marsala-wine tasting is more like an aperitif here, with appetizers and canapés, sandwiches stuffed with Sicilian pesto, which is made of dried tomatoes. We like in particular the spicy onions and tomatoes. And we like the prices, real value for money. And don't forget the fun. This bar is charming and friendly, like the owner who will expertedly guide you through your sweet wine experience. Ther 's also the chance to buy the Marsala tasted and have it sent directly to your home.